Perovskia atriplicifolia is a native to Afghanistan and was named the Perennial Plant Association’s Plant of the Year in 1995. Russian Sage has tolerance to heat and drought and also will not be eaten by deer. During the long bloom season this upright plant will put out sprays of lavender blue flowers which attract butterflies and make nice cut flowers. 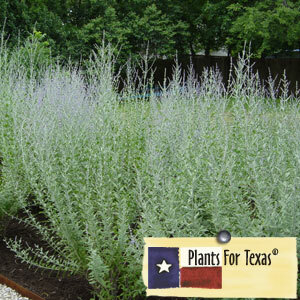 Russian Sage has silvery fine textured foliage, similar to Artemisia spp. and can grow 3-4′ tall with an equal spread. This plant should be cut to the ground each spring before new growth begins to ensure a lush full growth for the next season. Perovskia atriplicifolia is part of our Plants For Texas® Program, meaning it was Texas Grown, Tested in Texas to perform outstanding for Texas Gardens.